In his research to determine the best approach for a congregation just starting out as well as an established one with an existing facility, Gordon focused on the question that “if a church should be unable to build any component found in the Master Plans of the day, which one would it be? And if dropped from the project, would the function of that space be possible within another without excessive costs?” This led him to the discovery that in designing church facilities, the idea that the size of the narthex area (at that time a small vestibule immediately off of the main worship space) could be enlarged to not only meet the functional issues that arise from an expanding church, but to also meet the needs of a new church by providing them flexible space for worship, fellowship and dining – a facility core that could expand as ministry and finances dictate. 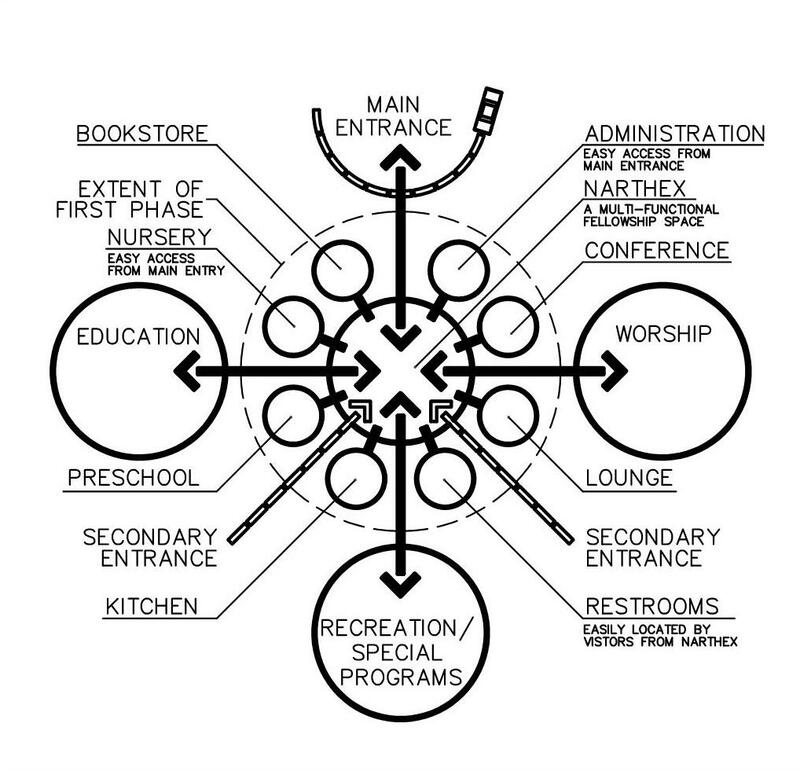 This new General Model of church planning led Gordon through his Architectural Thesis and on to establish Dimensional Dynamics, Architects and Planners in 1971. The following is an ideal relationship of spaces whose principles have been proven to be effective in many new and renovated facilities across the country. Refer to the generalized “bubble diagram” below for the placement of some of the spaces that are described. The narthex should be the functional core of the church facility with all other spaces flowing around and from it. The main entrance and all secondary entrances into the facility should lead directly into this space to aid congregant and visitor with finding their way. The narthex should be a place of welcome for the visitor; immediately they can orient themselves to their surroundings. They can visually find the administrative offices, restrooms, nursery, sanctuary, educational spaces, and all main circulation routes. On Sundays, this space becomes the church’s “family room” with electronic displays, bulletin boards, community displays, resource materials, and refreshments to reinforce these important times of sharing. If possible, it should be located so as to function as sanctuary overflow for Sunday services. At other times this space can serve as a fellowship hall or be divisible into spaces of varying sizes to accommodate most any function. The church offices should function as the facilities control center, overseeing the facility, as its occupants receive input and easily appropriate resources to meet those needs. The administration area needs to not only be efficient but should be accessible, both visually and physically. It should express a warm and caring nature, while also communicating a sense of confidentiality. It should be secure for staff, equipment and records as well as being energy efficient, due to its considerable use throughout the week. During the week, monitoring people entering and leaving the church facility is an important role. The secretary/receptionist should be located close to the main entrance. This easy-to-find location is especially significant for people who are making deliveries or wish counseling. For some, this may be their first contact with the church, and a positive experience may encourage them to become regular church attendees. Off the secretary’s area should be the administrative workroom. This workroom should house all the church’s copy and fax machines, office supplies, and records. From the secretary’s area all pastor’s offices, staff powder room and coffee area would be accessible. A conference room where 90% of church meetings can be held during the week should also be in this area, possibly accessible from the narthex for committee meeting when the office is closed. If properly designed a functional church office area can help communicate the life and vitality of the Gospel to those in need. This easy-to-find space, close to the main entrance, lessens the anxiety level of both parents and children. A parent with several small children will usually want to place their infant in good care before escorting older children to other classrooms. The younger the child, the closer the program space should be to the main entrance and narthex. School age children will accept traveling down a hallway, while younger children express concern with “distance” into a building. The nursery’s location, near the front entrance not only allows the parents to drop off their child soon after entering the facility and pick them up just prior to departing, but it also provides quick evacuation of the nursery in case of an emergency. Large glass window facing into the narthex may allow not only the proud parents to check on their child without disruption, but also provides older church members the ability to visualize their church continuing into future generations. The baby’s comfort is absolutely necessary but the parents are the ones who make the decision whether to return next Sunday. Their perception of the care and facilities provided is paramount. The location of handicapped accessible restroom facilities should be readily apparent to newcomers who should be spared the embarrassment of asking where they are. When a first-time attendee feels comfortable in finding his or her way around the facility, they feel more at home and are more likely to return. This space should be easily visible to both weekly visitors to the facility and worshippers on Sunday morning as they pass on their way to and from the sanctuary. The goal is to get books and literature in the hands of the people. This rarely occurs when the library is placed in a hard-to-find location. This space’s location should be such that the kitchen’s use can range from the preparation of light refreshments during fellowship times, to any dinner that may occur in the narthex and/or fellowship hall space. Perhaps few areas in a church facility elicit stronger opinions than that of the church kitchen. Rarely are they considered “just right”. This is because the church kitchen users vary from folks who just make coffee to those who can put together full dinners for hundreds at one setting. As one might imagine, the space size and equipment needs fluctuate considerably between these extremes. Many factors now play in the design and function of a church kitchen, from its use, to its users, and building codes. Today church kitchens are considered by the code to be “commercial” rather than “residential” regardless of how the kitchen is used. This is due to a church facility being labeled as a “public building”. However when all factors are considered a safe and efficient church kitchen can be the source of tremendous ministry, outreach, and fellowship. These rooms must be easy to find and not too far from the main entrance. Educational areas should be designed with flexibility, storage and acoustics in mind. Incorporating movable partition walls, individual closets, carpeting, and acoustical ceilings are some of the best ways to solve the usual problems encountered with ever changing ministry needs. The Sanctuary should be located immediately off the narthex and not to far from the main entrance and restrooms. Generally people do not prefer to walk long distances to get to this primary space. Though the size, shape, and configuration of worship spaces vary from church to church, its location should be such that overflow seating can be placed into the narthex when necessary. When properly designed, the narthex can serve for many years to meet the church’s ministry needs that require these spaces. However as a church grows and their ministries expand, a well thought out fellowship hall can not only give the church the ability to meet their members needs for fellowship, banquets and recreation, but also serve as a tool for community outreach ministries. With the use of folding walls, a fellowship hall can also be used as flex rooms on Sundays or during the week. This would enable the space to be used to meet many ministry needs, instead of just being a dedicated dining hall, used infrequently by the church members. ← OPEN HOUSE OR SECRET SOCIETY – How Inviting is it for People to Access your Church Facility?